I’ve been doing some fascinating reading the last few week and thought I’d share the ones that stuck with me. You may have noticed a few reblogs appearing in the stream. 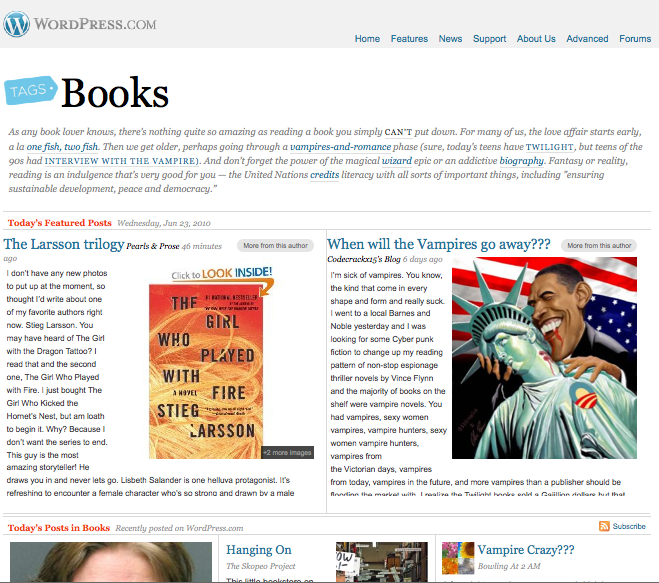 I’ve been using WordPress’s reblog button and loving it very much! These are non-reblogged though. Also impressed by their much improved tag pages. Like this one, for books. An excellent open letter by Brian O’Leary to Scott Turrow about piracy, data and good and bad decision making. A very fine article over at Slate (Thanks to SarahB for the tip) on ebooks and paper and why one will not replace the other. Agree or disagree, the writing is solid. A nice find in general, Slow Media, one I was directed to by the excellent blog Casual Optimist. James Long over on Speculative Horizons has a great list of four upcoming titles by four of my favourite fantasy writers. Smashing line for literature at the Kilkenny Arts Festival this year. Philip Jones points to the clash in perception of the future for books in the digital age between Jeff Bezoz and Hachette UK’s George Walkley. Nicely done too. With the Russian spying scandal in the US, Yale University Press talks spies! Well worth the read and considering a new book purchase too. Despite a tough market, Barnes & Noble have been very upbeat about the future in terms of digital and print sales. I hope they are right. The summer seems to be rolling in this year (when does it not), but at least it’s been a good one so far!